Buy Engraved Bricks, Tiles, Benches and More! Click on each of the products above for more information. Our engraving services are not limited to engraved bricks, tiles, marble or granite pieces. We can engrave on almost any material! Simply let us know what material you are using or would like us to engrave. All of our products come with a lifetime guarantee. We can offer this guarantee because of our years of experience, our state-of-the-art manufacturing equipment and our highly trained staff. In fact, in over 25 years that we have been in business, we have never had to replace a brick due to cracking or any degradation to the engraving. If for any reason you are not satisfied with your Bricks R Us product, we will gladly replace it at no charge. If you have any questions about our products or our engraving process, contact us today and we will reach out to you within 24 hours! A Finished Brick is a brick that has a smooth surface and beveled edges with space bars on the sides and is created to be a "pretty brick." This is our most popular clay memorial brick and comes in matching 4x8” and 8x8” sizes. It is primarily used on a sand base with a thickness of 2 1/4". To learn more, please contact us. We look forward to speaking with you! A Belden Brick is a commemorative brick that has a rough surface and straight or beveled edges. This is a popular brick and comes in matching 4x8” and 8x8” sizes. It is primarily used on a sand base with a thickness of 2 1/4". Learn more about this product by calling us at 888-MY-BRICK or sending us an information request form. A Standard Brick is a wire-cut fundraising brick that has a rough surface and looks like your typical outdoor brick. This brick only comes in 3 5/8 x 7 5/8 but has two thicknesses - 1/2" and 2 1/4". The 1/2" is used for a concrete base and the 2 1/4" is used for a sand base. Contact us to learn more about the Standard Brick! Engraved concrete bricks have a smooth surface and beveled edges with spacers on the sides. This type of brick comes in matching 4x8”, 8x8” and 12x12” sizes, which makes it different from a clay brick (clay bricks only come in 4x8” and 8x8 sizes”). Concrete bricks are primarily used on a sand base with a thickness of 2 3/8". Concrete bricks have more of a variety in color. 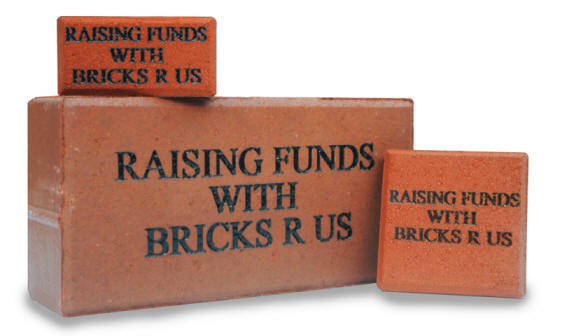 To help you customize your brick fundraising campaign, Bricks R Us offers more than 15 color options for concrete bricks! If you want to learn more about this product, contact us and we'll be happy to help. An Alfagres Tile is more of a tile and is primarily used for a wall or ground (with a concrete base only) surface. Engraved Alfagres Tiles come in matching 4x8, 8x8 and 12x12 sizes with a thickness of 1/2". They are durable for both the indoors and outdoors. Submit an information request form or call us at 888-MY-BRICKS to learn more about purchasing Alfagres Tiles. The Quarry Tile is just like our Alfagres line and is primarily used for a wall or ground (with a concrete base only) surface. Engraved quarry tiles come in matching 3 5/8 x 7 5/8 and 7 5/8 x 7 5/8 sizes (modular) with a thickness of 1/2". They are durable for both indoors and outdoors. Contact us to learn more about purchasing Quarry Tiles! Marble tiles are primarily used for wall surfaces. 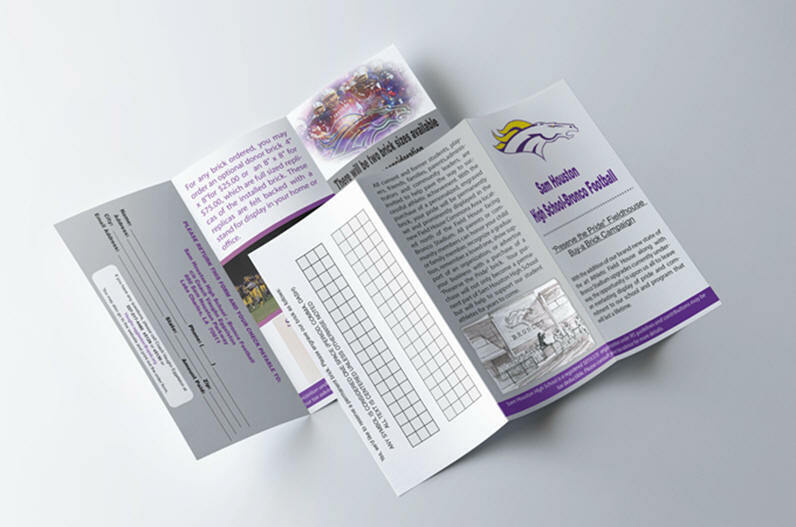 They come in matching 4x8, 8x8 and 12x12 sizes with a thickness of 1/2". They are durable for both indoors and outdoors; however, we do not recommend outdoor ground installations due to a potential slipping liability. Contact us for more information! Granite tiles are primarily used for wall surfaces. They come in matching 4x8, 8x8 and 12x12 sizes with a thickness of 1/2". Granite tiles are durable for both indoors and outdoors; however, we do not recommend outdoor ground installations due to a potential slipping liability. Call us at 888-MY-BRICK or send us an information request form for more information. Souvenir bricks are an effective way to raise additional funds for your organization. These miniature gift bricks feature a felt backing and can be offered to your donors at an additional price. Your donors will be able to showcase these in their homes or offices. These smaller souvenir bricks can be made to match a larger brick that was ordered. There are many ways you can use these miniature souvenir gift bricks. They can be offered as an add-on to any order. You can set multiple donation levels and use them as a gift for your high-level donors. Just be sure to factor in the cost of these gift bricks when budgeting your fundraising efforts. Donors will love these miniature souvenir bricks to decorate their homes or offices. They are made of the same brick materials as our original bricks, but they are a third of the size. Souvenir bricks are sure to be a cherished gift for many years to come. 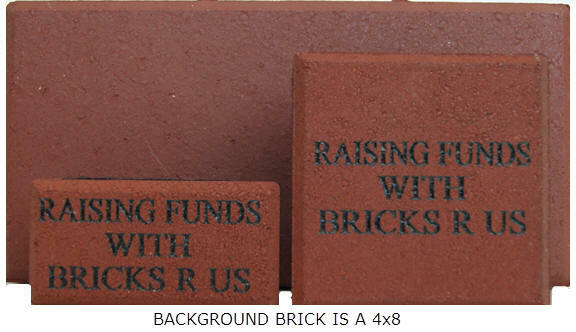 Choosing an engraved bricks project to raise funds for your organization is a wise choice. It’s an easy way to raise the extra funds needed for your organization. Donors are sure to love this type of project, and they’ll love having the option of ordering their own souvenir gift bricks! Check out the pricing below and order yours today! Call 888-MY-BRICKS for more information. Donor bricks or tiles are another way to raise additional funds for your organization. These duplicate bricks with a felt backing can be offered to your donors at an additional price so they can display them in their homes or offices. These bricks are priced at the normal brick pricing minus $1.00 (per brick). 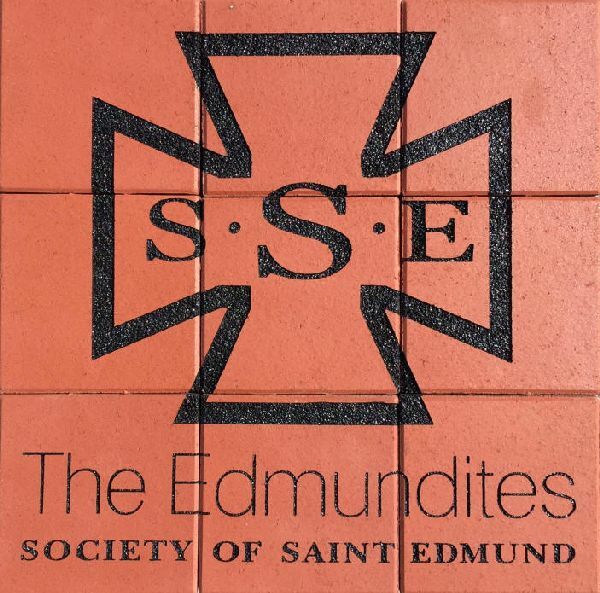 The smaller donor bricks are referred to as Souvenir Bricks. Donor bricks are very popular as they give donors a keepsake, which reminds them of your project and your organization’s cause. It’s a great way to stay top-of-mind with your donors. For school projects, a donor brick can be a great gift for the retiring principal or teacher. Think about it: There’ll be one engraved brick for the project and one for a keepsake, which is sure to be a cherished gift. 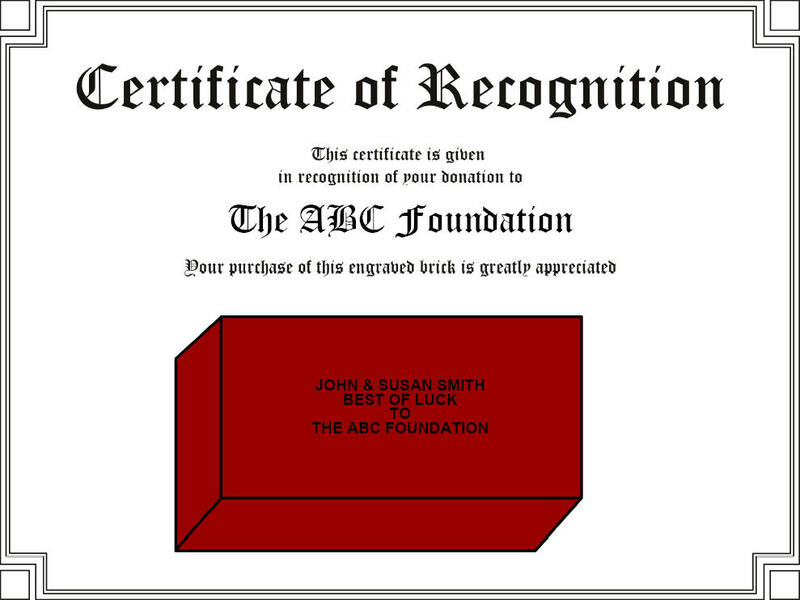 For a large campaign, fundraising organizers may choose to gift donor bricks to those who donate at the highest level. This type of gift is great for showing appreciation to your donor! Choosing an engraved bricks project to raise funds for your organization is a wise choice. It’s an easy way to raise the extra funds needed for your organization. Donors are sure to love this type of project and they’ll love having the option of ordering their own donor bricks. Check out the pricing below and order yours today or contact us for more information.